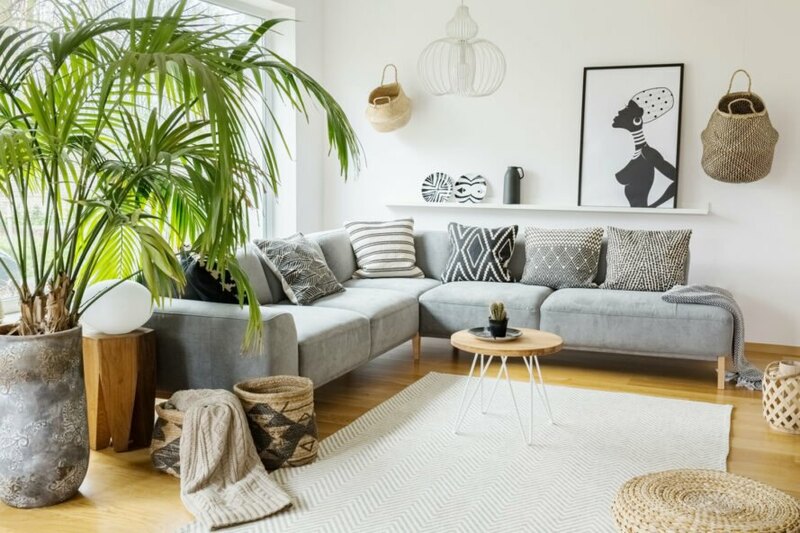 Adding plants to your living space is an easy way to add beauty and character to your home. But aesthetics aren’t the only benefit of indoor gardening as houseplants can make your home’s air healthier and also make you happier. No to mention, you can easily grow useful plants and herbs that work great for healthy cooking and as natural medicines. Even if you weren’t born with a green thumb or have a tiny space to work with, there are ways to go green with your decor. If you choose the right plants and get creative, your indoor garden will thrive. Here are nine ways to add more plant life to your home. For many indoor plants, sunlight is essential. 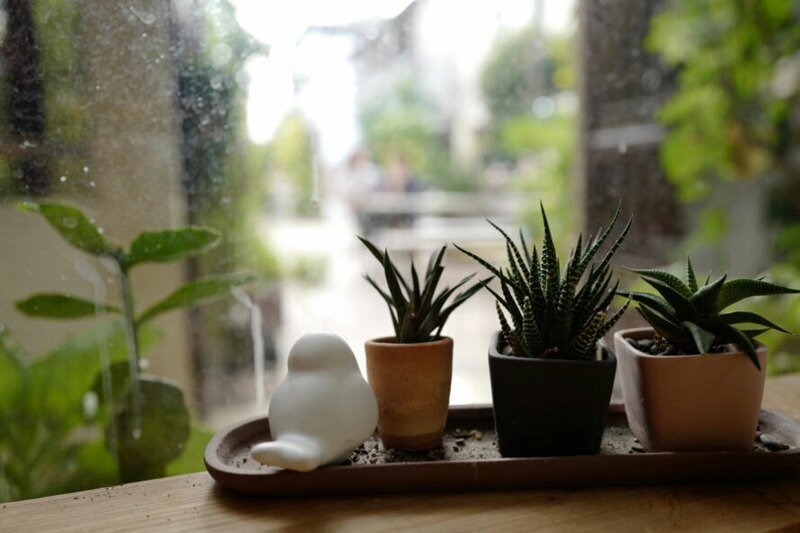 So, placing your plants near windows is a no-brainer. A Beautiful Mess suggests a DIY ledge for the kitchen window to set up your herb garden or hang an over-the-window plant shelf in your living room or bedroom. Instead of hanging a curtain for privacy, you can create a “plant shelfie” and group a bunch of plants together or use a large sturdy tension rods to hang plants at the top of the window. Custom shelves around or under the window — or added to the ledge — also work well, too. Jazz up a plain wall with a wire grid and S-hooks to display houseplants. You don’t need a ton of space for this idea, and it makes it easy to hang gardening essentials like scissors and a watering can. You can find wire grids in different shapes and sizes, and some also have mountable shelves. A window in your kitchen is an excellent place to grow an indoor herb garden, however, that’s not an option for everyone. You can still make it happen by hanging small planters on your cabinets. Also, if you have the counter space, you can create a small garden for succulents with a two-tier fruit basket and some fabric scraps. Like the wire shelves, a pegboard is also a great idea for small spaces. They work well in any room, no matter how big or small. You can even use a peg board as a headboard. The great thing about pegboards is that you can use hooks, baskets and shelves to create the look you want. You can also add a pop of color with a few tiny potted plants or cover the board entirely. Speaking of macrame, it has made a major comeback recently, which means you can easily find macrame plant hangers to hang from the ceiling. They are great to hang near windows, or you can use ceiling hangers in unexpected places like in the bathroom or over a dining table. When you live in a small space, ceiling hangers are a fantastic option. You won’t give up any shelf, floor or wall space, and they add a fun, unexpected layer to the decor. Turn plants into pieces of living art by adding them to string art or macrame wall hangings. You can find tons of affordable options on sites like Etsy that can quickly turn plants and flowers into artwork. Plants and flowers nestled into different designs look great. Air plants are a great option for wall art because they are super easy to take care of. If you have built-in shelves in your living room, bedroom or kitchen, don’t let the high shelves go to waste just because they are out of reach. Add some plants that drape down to add some green to your space. Trailing plants are very popular and they are low-maintenance. 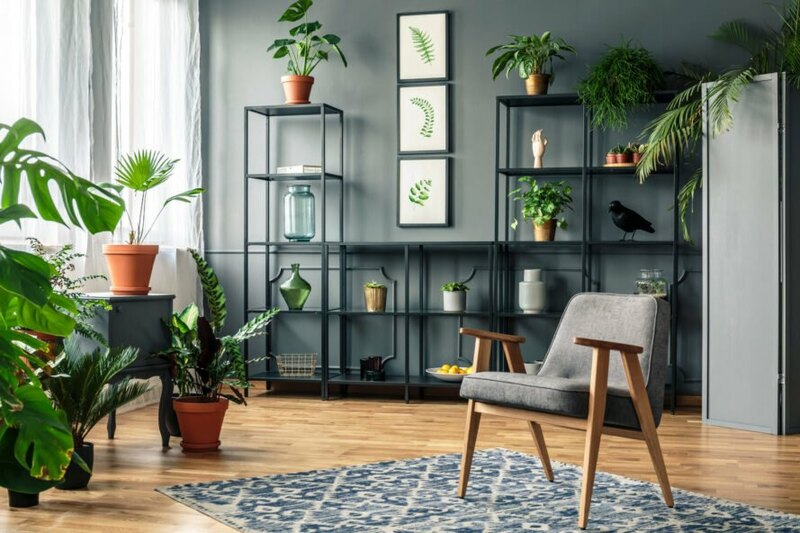 If you have the option of adding something to the wall, pictures ledges are perfect for displaying plants indoors because the small lip on the edge will keep them from falling. Picture ledges are usually cheaper than traditional shelves. Just make sure you choose ledges that are wide enough. If there is a small, dull space in your home that needs some love, you can add some plants with a rolling cart. If you live in an apartment and can’t add shelves, grids or peg boards to the wall, a rolling cart is the perfect option for creating a mini-jungle. Or, if you have some dead space in a large room, the cart doesn’t even have to go up against the wall. If you have an empty corner that needs some attention, consider filling it with plants of different shapes and sizes. Place different pots (of various shapes and sizes) in the corner to create a plant corner. You can incorporate your plant cart into the area for some added height. Adding plants to your home can be a great way to bring in color and ambiance. If you have limited space in your home for plants, try placing them by your window. 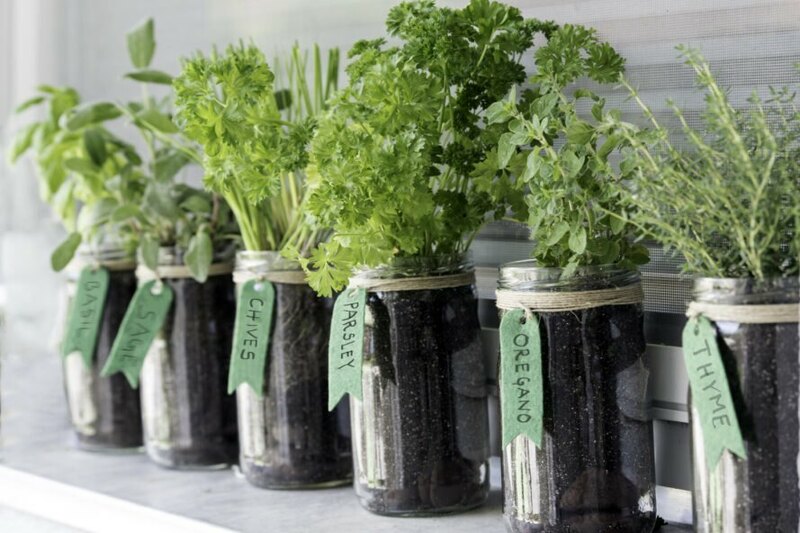 Keeping fresh herbs in your kitchen is an easy and simple way to add a fresh taste to your home cooked meals. 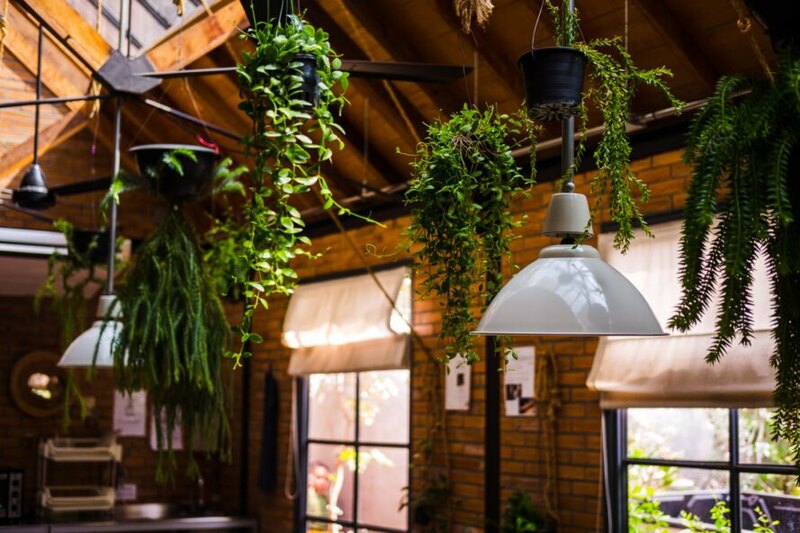 Hanging plants from your ceiling is a great way to save space and add depth to the room. Use a plants to decorate a simple bookshelf and add a splash of color. Placing a plant in a corner of a room can fill empty space.